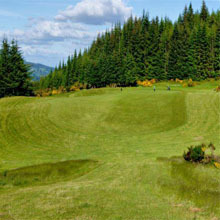 Strathpeffer Spa Golf Club was founded in 1888. One of the original course designers was "the grand old man of golf" Tim Morris of St Andrews. In more recent times Peter Allis has described the course as a jewel in the Highlands of Scotland. The panoramic views down the Peffrey valley to the Black Isle and from the upper end of the golf course, westward to the Fannich hills highlight the natural beauty of the Scottish countryside. It is arguably the most scenic golf course in the North of Scotland, a view regularly confirmed by visitors from around the world.